LAHORE: (Tuesday, June 6, 2017): Punjab University Institute of Business Administration and Plan9-PITB’s Technology Incubator have signed a memorandum of understanding for promotion of entrepreneurial skills among the youth. In this regard, an MoU signing ceremony was held at committee room of Vice Chancellor’s office here on Tuesday. Punjab University Vice Chancellor Prof Dr Zaffar Mueen Nasir, PU Registrar Dr Muhammad Khalid Khan, Director Entrepreneurship and Enterprise Development Nabeel A Qadeer, PU IBA Incharge Sajida Nisar and other officials were present on the occasion. The memorandum calls for organizing different capacity-building training programmes for students and develop their interaction with the institutions and commercial world. Addressing the meeting, Dr Zaffar Mueen Nasir said that the initiative would move PU efforts to inculcate entrepreneurial spirit among its students one step ahead. 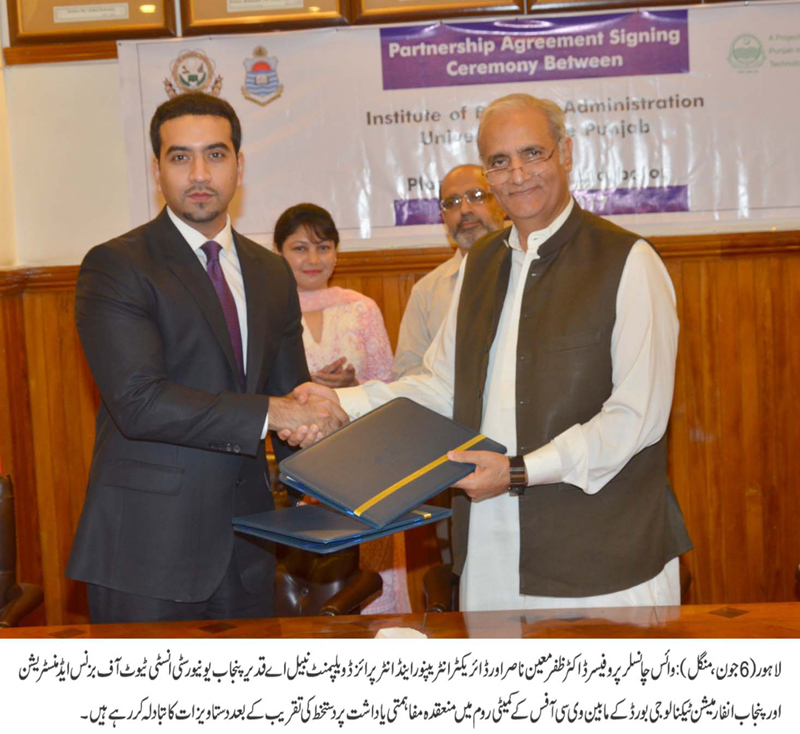 He said that the MoU would also promote cohesion between the industry and academia. 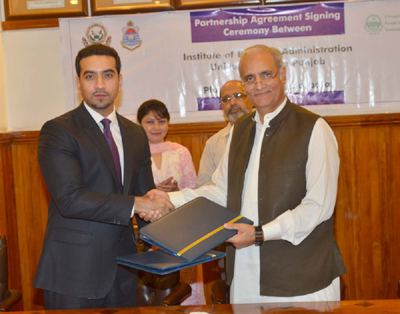 Mr Nabeel A. Qadeer said that the MoU signified the intention of Plan9 and PU IBA to forge strong mutual ties between industry and academia for the progress of the two sectors. He said that Plan9 aimed at replicating its model of business incubation that was considered credible globally to guide our partner in establishing their business incubation centre. Ms Sajida Nisar said that Plan9 would provide access to its network of trainers, mentors and investors to incubatees of IBA, She said that workshops, trainings and mentoring sessions would be arranged at the premises of IBA where startups would be invited to interact with the Plan9 mentors. She said that an exchange program would be initiated whereby a startup nominated by IBA would be offered an incubation spot at Plan9 every cycle, subject to an interview with the Plan9 management.